5) Don't forget to add your email. You have from now until June 21st 2010 at 11pm eastern time to enter. The contest is open to everyone ( yes everyone). One winner will be drawn via random.org. Note: the winner will have 2 days to respond to my email otherwise there will be another draw. I want this shirt simply because it is mad cute. i have never won anything before.I hope i win this one. This shirt is so cute! I'd totally rock this shirt, it would fit in my wardrobe quite well! I don't like contest but this is so irresistible. 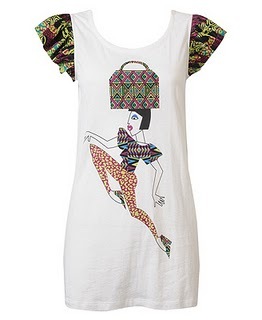 I want the shirt because of the african look and it is super cute. I think am the winner by faith, maybe...love this shirt and will rock it in summer. What a fabulous contest! OK, I am following your blog and now "like" or joined your FB group. (So happy I found your blog, btw.) And so I would love to win this blouse because it is an ethnic glam blouse, that would make any outfit pop. I could see myself wearing this with a pair of skinny jeans and a hot colored heel. It looks light-weight enough for the summer, and I would be delighted to wear it. Whoops! My e-mail address: ElanaBP@msn.com.